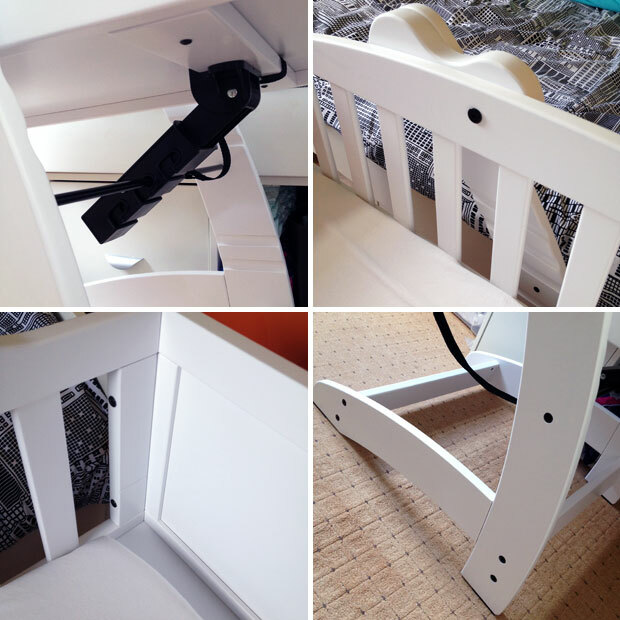 Last month, I introduced you to the clever and wonderful MULTY which is a very versatile piece of nursery furniture that transforms from a clever baby crib to a sturdy highchair and storage system. You can read my introduction post here. The first use is as a baby crib but not just any baby crib. The MULTY is rockable and best of all you can tilt the basket part to be at an angle which is amazing for babies who suffer from reflux and any baby suffering from a cold. There are three different settings — locked flat, a gentle tilt and a bit more tilted to approximately 10 degrees. My second baby is completely different from my first baby. My first baby never really vomited except for a handful of times but baby number two has been sick many hundreds of times since she was born. I think she has a mild form of reflux where she struggles to hold liquid down if she’s not sat up after a feed. She doesn’t seem to be in any pain from acid or anything but, since birth, she always gets really fussy when I lay her down after a feed and a minute or so later she brings up lots of milk. She’s breastfed so it’s very difficult to regulate how much milk she has. We decided to keep her upright after feeds by sitting her up on our laps or in her baby bouncer chair. Burping would sometimes help but also sometimes bring up the milk! Sleeping was difficult because we had to go against all advice and let her sleep on her side — propped up with pillows in the day and next to me at night. This worked but meant I had to keep checking her every minute to make sure she hadn’t moved any cushions and at night I’d have to sleep with a hand on her holding her still on her side. She could roll over from the very start so there was always a risk of her rolling in her sleep. The advice is to not have anything in the cot with your baby but that was very difficult when she’d only sleep at an angle or on her side. You can get wedges to put under your baby’s mattress but they affect the shape of the mattress too so I’m not sure they’re any good. In comes the MULTY! 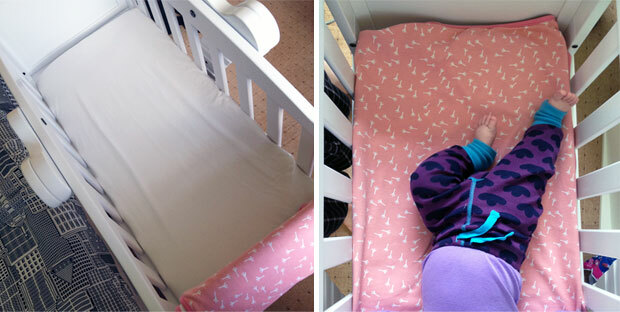 It’s so clever and really is the perfect cot bed for babies who suffer from reflux. It’s really simple to angle by adjusting the mechanism at the bottom. You can rock your baby to sleep if he or she likes that and then set it at the angle your baby prefers or lock it flat. The MULTY gave me to option to lay my baby down safely in her bed without having to prop her up with potentially dangerous cushions and without worrying about her choking if she was sick whilst sleeping. The MULTY crib made sure my baby was comfortable and gave us parents peace of mind. The MULTY is constructed beautifully. It’s really easy to assemble thanks to the design and the very well written and illustrated instructions. 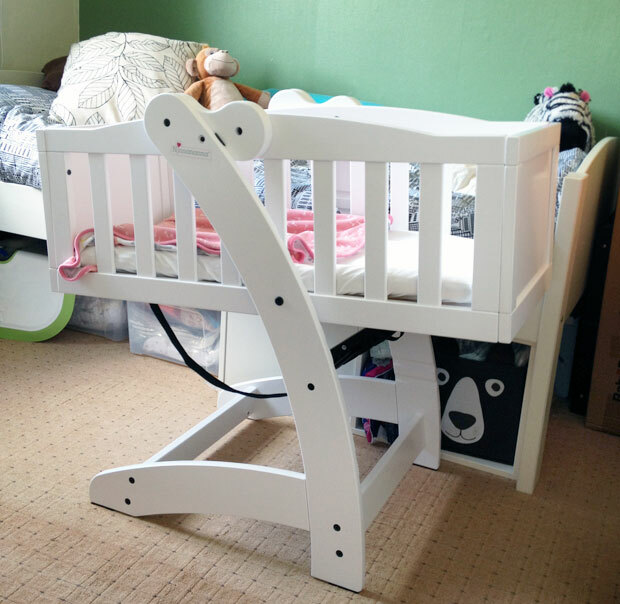 It’s a very sturdy build which is of course very important when it comes to baby products. The rocking is very smooth and changing angle settings is so easy and effortless. 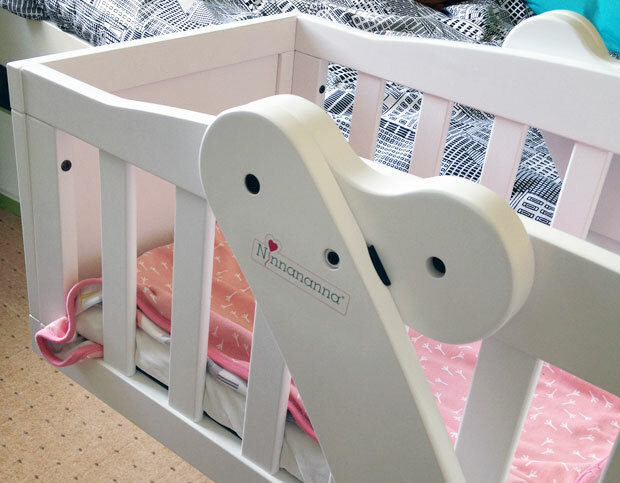 The crib is stylish and cute at the same time and the compact design means it fits in most bedrooms. You can choose to have a shelf at the bottom too for extra storage. Like most cribs, the MULTY can be used until your baby can pull himself/herself up or can sit up — usually around 6 months. Then it’s time for weaning and the highchair function of the MULTY. Stay tuned for a review of the highchair and storage phase coming soon. 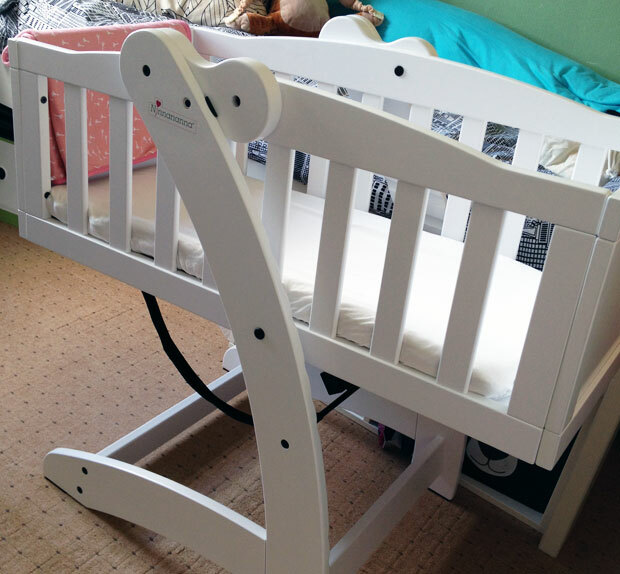 Read more on Ninnananna.eu where you can also purchase your own MULTY!